This item arrived very quickly and was very well packed. This battery is absolutely ideal for my classic Triumph Tiger 90 as it allows space for foam padding around it. These older 'bikes are a bit vibey. Good service. My questions answered Ok. Delivery prompt. No actual advice note/receipt with the battery but online ordering info was fine. Would use again. This was the first time I had used Tayna and was a bit apprehensive. However, I needn't have been. The service was first class. Very quick delivery, great service. Second motorcycle battery I have bought from Tanya Batteries - same fast and excellent service both times. 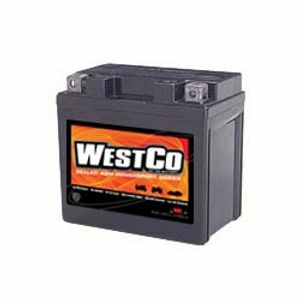 Westco batteries are just the job for my quad and motorcycle - sealed and maintenance-free - superb! Prompt delivery. Battery functions well . After a few weeks it is impossible to give an overall view or 5 stars as only time will tell if it rates 5 stars. So far service and performence have been excellent. J K.
Fast efficient service, couldn't ask for more. Excellent!